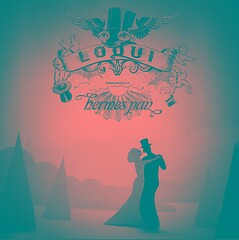 Happy New Year from Loqui! You may have noticed it’s been a while since you last heard from us. The reason for this is not that we’ve been resting on our laurels and eating pies, oh no. In fact we have been beavering away behind closed doors with the fantastic Bruce Wood at Touchwood Studios, and as a result are now at least halfway through making our debut album. We’re incredibly excited about how the tracks are shaping up, and are confident that the result will be, finally, the album that we’ve been promising to make for all these years. We’re planning to take our time with this one and make sure it’s as good is it can possibly be, but expect to hear something before the year is out. A little something to warm your cockles on these shivery January evenings: a live recording of our frankly ludicrous version of the old Barry Manilow / Take That favourite ‘Could It Be Magic’. If you haven’t heard this on the odd occasion that we’ve trotted it out live, have a listen – it’s really quite an, um, thing. Go here. Sadly, the album sessions are going to mark the point at which we say goodbye to our resident pie expert and ludicrously good drummer, Rich Laws. Rich moved back to his hometown of Weston-Super-Mare a while back, which is a stretch even for a band whose members are spread across Otley, Leeds, Bradford and Thurlstone (look it up. Actually, don’t bother). We wish him well. What this means, of course, is that we’re in the market for a replacement. If you know your way around a kit, live somewhere around the West Yorkshire region and can stomach the idea of working with a set of self-centred egocentric primadonnas like us, apply within! To whet your appetite for the upcoming album, go here for some videos of new songs taken from our last couple of gigs. Picture/sound quality is a tad rough’n’ready, but you’ll get the idea. Go to our Myspace to hear two brand new and exclusive live acoustic songs. Once in a while we like to dispense with that loud and frightening electicity stuff and take to the stage armed with proper wooden guitars, mandolins, bongos and all manner of other archaic paraphenalia. None of your tedious MTV Unplugged busking here, our acoustic set is still louder than most bands plugged! Occasionally we even manage to record it, and that's where these two new tracks come from. REMOTE CONTROL is a completely different version of a track that we put out as a demo a few years ago (also included on the compilation I Can't Believe It's Not Better). CONFECTIONARY LOVE, meanwhile, is a brand new song that will be appearing, in completely different form, on our debut album when we eventually get round to making it. Have a listen to them both - we wouldn't have put them up if we didn't think they sounded a bit special.